Below we share our review of the Samsung Galaxy S5 that is for use with Tracfone prepaid service. TracfoneReviewer is a blog that shares information, reviews and much more about Tracfone Wireless to help consumers save money and find answers to their questions. If you're looking for a powerful smartphone to use with Tracfone and don't want to try out the BYOP program, the Samsung Galaxy S5 from Tracfone might be the phone for you. Three new (to Tracfone) phones recently became available including the Samsung Galaxy S5, which was the most notable of the trio for us (the other two are the Samsung Galaxy E5 and Samsung Galaxy Core Prime). The Samsung Galaxy S5 was first released to the public in April of 2015, making it one of the most recent phones Tracfone has added to their lineup. Many of the phones that Tracfone releases to use with their service are several years old, which is challenging for smartphone users where technology is progressing at a rapid pace. A phone that is a few years old will generally do the basic functions just fine, but will struggle and run slowly when trying to operate with multiple applications running at one time. The Galaxy S5, however, is a phone that can keep up with multiple programs running at once, or even more resource intensive apps and games, due to its fast, quad-core processor and 2 GB of RAM. Before we get too far, let's look at some pro's and con's we've discovered. 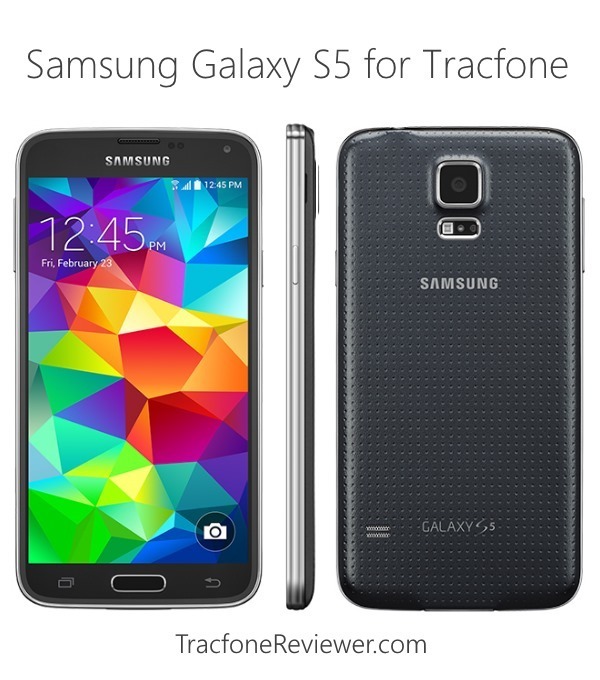 The Samsung Galaxy S5 from Tracfone is basically a really great smartphone with a lot of impressive features that users have been desiring for a long time. But, its expensive. Let's dig into the full list of features and phone specifications for the Galaxy S5 to see how this phone is better than any other device offered by Tracfone at this time. Below are the features for the Galaxy S5, followed by the phone specifications. Size: 5.59" x 2.84" x 0.31"
This phone brings a whole host of features and upgrades that most Tracfone users haven't experienced because no other Tracfone device at this time can compare to the Samsung Galaxy S5 (except, perhaps, the Galaxy E5). The LG Sunset, for example, has 1 GB RAM, 8 GB Internal Memory and a 5 MP Camera, about half as good on each of those features compared to the Galaxy S5. But the Sunset does have 4G LTE just like the S5. Let's get into what we like and don't like about this phone, where we will also review many of the great features the Galaxy S5 comes with. The Samsung Galaxy S5 was the flagship phone for Samsung when it was launched, which means it was loaded up with the best tech and newest features. We like a lot of things about this phone, because it comes with a lot. So let's break it down and get into reviewing some of the most exciting features. The first thing you notice about this phone is the screen, which is an impressive 5.1" and has a resolution of 1080x1920, which is better than any other Tracfone smartphone at this time. It also has a pixel density of about 430, making for very crisp, clear viewing on this phone. Internal memory and RAM are both great features on the S5, which comes with 16 GB for storing apps, photos and other things, and 2 GB for running multiple apps at once. The 2.5 Ghz processor is also very good, and should have no problem keeping up with the latest games and applications you may want to run on your phone. For Tracfone users who want to do some phone photography, the Galaxy S5 has a very impressive 16 MP rear camera that comes with a host of features all to itself. You also get a 2.1 MP front camera for selfies and video chatting. The rear camera has auto-focus and flash, and will record video at UHD 4K quality. Take a look at some photo samples on flickr to see the quality for yourself. One additional feature that we're quite impressed by is the Galaxy S5's IP67 rating, which means that it is dust resistant, and water resistant up to 1 meter deep, for 30 minutes. You can watch some of the waterproof tests on YouTube if you're interested. It is never a bad thing to have a phone that won't be ruined because of an accident or a moment of forgetfulness. Finally the S5 does come with a handful of extra features that may or may not be useful to you, like a heartbeat sensor, gesture controls, smart scrolling and more. For performance and features, the Galaxy S5 is unmatched by any other Tracfone device at this time, and delivers a full smartphone experience. It's not all good news though, we do want to share a couple of concerns about the Galaxy S5. While there are so many great features with the Samsung Galaxy S5, there are two things we don't like, that might be deal-breakers for some Tracfone users. The first is the price, which is rather steep. The Galaxy S5 is only available through online retailers HSN.com and it is listed for $499 bundled with a 1 Year/ 400 Minute card, and some additional items. The airtime card is worth $100, making the phone cost closer to $399. Our issue with the price is that you can find an unlocked Samsung Galaxy S5 on Amazon for $325 (and closer to $200 if you're willing to buy a refurbished model). You can then get a SIM card from Tracfone, and use the phone on the BYOP program. The second negative about the Samsung Galaxy S5 is that it comes with Android 4.4.2, and cannot be updated. If you get the unlocked version, and bring it to Tracfone's BYOP program, you will be able to update it to version 5.0.1, but the Tracfone version is locked at Android Kitkat, which has some known security issues. If you are concerned about your phone's security, then look into the BYOP program. If the two negative aspects of the S5 don't worry you, then the Samsung Galaxy S5 is a great buy and a great smartphone to use on Tracfone's low cost prepaid network. You will be getting high performance at low monthly costs. But if the price and possible security issues are a worry, we strongly recommend looking into the BYOP program from Tracfone which allows consumers to bring a wide variety of devices to use with Tracfone. The Samsung Galaxy S5 is available from HSN with a minutes bundle and is listed for $499. We will update this when we find the phone available from other sources. View the Galaxy S5's Interactive Tutorial to learn more about how the phone works, or visit Samusng's website for the S5 to read up on what they have for the phone, which includes a user manual. If you have any further thoughts or questions, leave a comment below. Each comment is reviewed before posting. 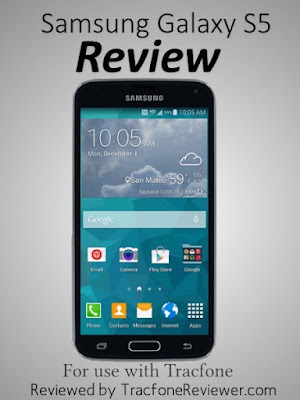 Below we share the features, specifications and full review for the Samsung Galaxy Core Prime (S820L). TracfoneReviewer strives to provide useful and helpful information to make it easier for consumers to choose what phone is best for them. Tracfone released three new Android powered smartphones through the retailer HSN.com to start 2016 off with some excitement. What's so exciting about these three new phones? Well you can learn about it on our previous post about it. Here we will be reviewing the Galaxy Core Prime, which is a smartphone that includes a number of great features, and comes at a very budget friendly price. For those who might not know, Tracfone is a wireless prepaid cell phone company that offers both phones and service. Consumers can also bring their own devices through the Tracfone BYOP program. Follow the link to learn more about how you can bring a wide variety of devices to use with Tracfone. A few years back Tracfone first started offering Android powered smartphones on their prepaid service, and they have continued to release more and more devices as demand and popularity has grown. All Android smartphone devices on Tracfone come with Triple Talk, Text and Data, but you can't use promotional codes when adding airtime. Now let's take a brief look at some of the pro's and can's for the Galaxy Core Prime. If you notice, we put 'average specs for a Tracfone smartphone' as both a good thing and a bad thing. The reason is that this phone is similar to several of the other Android devices from Tracfone, like the LG Sunset, however the specs and features it comes with aren't really that exciting to us, especially after looking at the Samsung Galaxy S5, which was also released for Tracfone with the Core Prime. Let'ts take a look at the full list of phone specifications and features to get a better idea of what the Core Prime offers. Below are the features that come with the Core Prime, followed by the technical specs. Size: 5.16" x 2.68" x 0.35"
As you can see from the phone's specifications, it comes with a number of features that put it right up next some of the better smartphones available from Tracfone at this time. The best way to summarize the Samsung Galaxy Core Prime is that it is similar to the LG Sunset, except the Sunset uses 4G LTE on GSM network, and the Core Prime uses 4G LTE on CDMA. So If you've been waiting for a 4G LTE device that works with Verizon towers, the Core Prime is your answer. 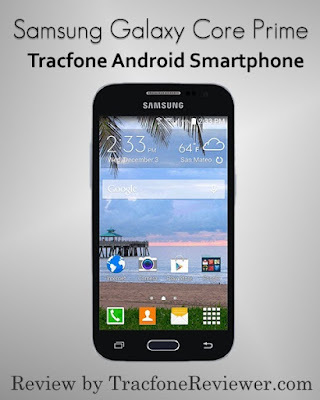 Now we will share some of the things we like and don't like about this smartphone device from Tracfone. The Galaxy Core Prime comes with a number of great features that help make it a phone that will be desirable for many Tracfone users. We like that it comes with 8 GB of Internal Memory, 4G LTE, and a very decent battery life. With 8 GB of space on the Core Prime, about 3 GB will be used by the OS and other pre-installed applications. That leaves about 5 GB for you to load apps, music, videos, pictures and anything else you might want. 5 GB of space is a reasonable amount that will allow you to load all of your favorite apps, along with some pictures and music, But if you plan to put a whole library of music, or a number of videos, you will run out of space. Fortunately there is also a MicroSD Card slot so you can load some things, like music and pictures, onto the external card. The Samsung Galaxy Core Prime is one of three new devices from Tracfone that use Verizon CDMA cell towers, and also have 4G LTE capability. The Core Prime is by far the cheapest of the three options, with the Samsung Galaxy S5 and E5 as the other two options, and currently going for $499 and $349 respectively. 4G is simply faster access to the internet using mobile data, allowing you sto stream videos or music at a faster rate to reduce buffering problems. We were impressed with the battery talk time and standby which is very good for a smartphone. This phone should be able to last all day on one charge with moderate use, and even longer if you keep data and WiFi turned off. Lastly, we are also really impressed with the current price for the Samsung Galaxy Core Prime, which is currently listed for $99 on HSN.com and comes with a 1 Year card, which is worth $99 by itself. Thus if you are already planning on purchasing a 1 Year/400 Minute card, you could by this phone package and get the Core Prime for free! There are a few things that we want our readers to be aware of if they are considering the Core Prime. First of all, the resolution for this smartphone isn't that great at 480x800. It gives you a dpi of about 207. This isn't too bad, but if you compare it to an iPhone 5, which is a few years old now, the iPhone has a dpi of 325, leading to clearer images because there are more pixels on the screen. We want to see Tracfone releasing more phones with improved screens for easier viewing. For most people, the screen on the Core Prime will be just fine and you won't notice any issues. The Galaxy Core Prime comes with Android 4.4 KitKat, which is better than using older versions, however, it is a few years old at this point and you won't be able to update to 5.0. The LG Sunset, which is fairly similar to the Core Prime as we have mentioned, comes with Android 5.0. Finally, the overall specs for the Core Prime are very good for a device from Tracfone, and especially at the current price, however, this isn't a phone that really 'wows' us but rather delivers very adequately and will be suited for low to moderate users. If you're someone who users their smartphone for lots of games, or other resource-intensive apps, you may want to look into the Samsung Galaxy S5, or the BYOP program. 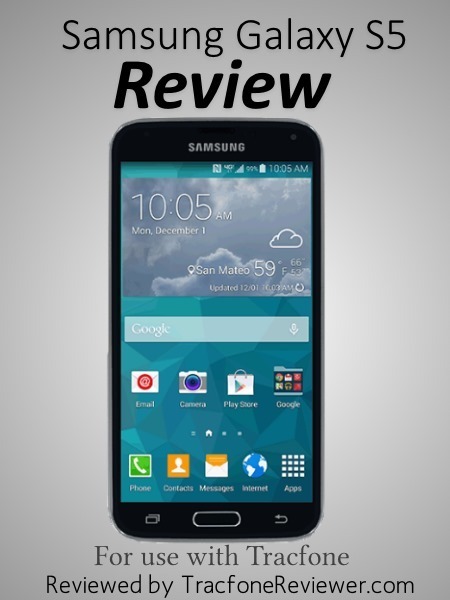 Overall, the Samsung Galaxy Core Prime is a good phone that is currently going for a great price. If you are a moderate smartphone user and looking for a 4G LTE capable device on Verizon's network, the Core Prime is a great deal. You can view the Samsung Galaxy Core Prime on HSN where it comes bundled with minutes, and other accessories. We haven't found the Core Prime for sale anywhere else yet, but will update when we do. Also take a look at the Interactive Tutorial from Tracfone if you want to learn more about how this device works. We have lots of resources here on this blog to share information about Tracfone, so take a look around. We suggest you start with our Beginners Guide to Tracfone if you're new or check out our List of the Best Android Apps. We have also created several resources relating to smartphones, including How to Check your Airtime on Tracfone Smartphones, How to Add Only Texts, How to Add Data Cards, and an Analysis of the Smartphone Only Airtime Cards from Tracfone. We hope this review has been helpful, and leave a comment below with any thoughts or questions you might have. Thanks for visiting TracfoneReviewer! 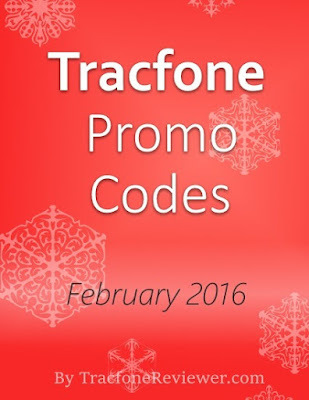 We provide lots of information about Tracfone including news, reviews and Tracfone Promo Codes, which you can find the latest for February listed below! Each month we gather and share with you the latest promotional codes to use with Tracfone. Each time you add an airtime card, you can also use a five digit coupon code to get additional minutes for free! Each code works with a specific airtime card, or any card of greater value (except the 1 Year/ 400 Minute card). So a code for a 60 Minute Card will also work for the 120, 200 and 450 Minute Airtime Cards. For those who might not know, Tracfone is a wireless prepaid cell phone service provider that sells both airtime, and cell phones. You can find many phones available through Tracfone and they usually cost less than $100. Take a look at our Cell Phone Reviews page to learn more about the different phone options available. Tracfone allows users to also bring unlocked smartphone devices to use with their prepaid service. Visit our Tracfone BYOP page to learn more, and see a list of some of the compatible phones. Be aware, however, that Android and Apple devices can't use promotional codes. Let's take a look at these new promo codes. These are the latest promo codes that are valid and working for February 2016. To view many more codes, visit our main Promo Code page. These codes may sometimes only be used once, so we suggest adding the code online, or over the phone in order to test multiple codes if the first doesn't work. 1 Year/400 Minute Card add code 50486 for 300 extra minutes for free! These are the latest codes that are valid throughout the month of February 2016. We hope you enjoy the free minutes and leave a comment with which codes you used! Tracfone just released three new smartphones that are capable of 4G LTE speeds using CDMA networks including the Samsung Galaxy S5. Follow the link to read our thoughts on the new phones and learn where you can find them. 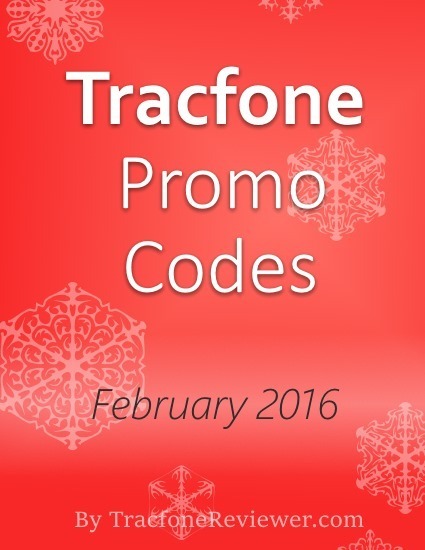 Stay up to date with the latest Tracfone news and promo codes by following us on Facebook!